I felt all the fine design lines within my chosen fabric dictated a lacy edge. I drew a scalloped edge echoing the line that frames the leafy shapes onto my background fabric with a fine white chalk pen. 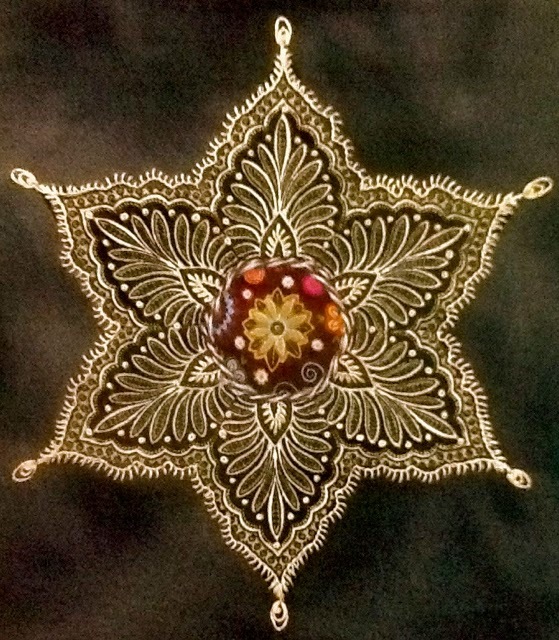 I used a buttonhole stitch with a 2-ply strand of cotton floss to embroider a lacy edge, as well as to cover the lines of the small leaf shapes radiating around the center. Nestled buttonhole stitches filled with a knot stitch accent the points. I also emphasized the dots within the fabric pattern with embroidered knots. The knot stitch that I prefer to use in all my embroidery is the Colonial Knot. It is more stable than a French Knot ... plus it's fun to make. I wrote a tutorial here. Another element that I have added is a striped black and white wool yarn. It's machine couched to frame the center fabric. Here's a tutorial I wrote about how I couch yarn in my work. There are two methods presented, one for edges and another for the middle of the work. Scroll down to the second one to see how I sewed the yarn to these centers. I hadn't made it a scalloped edge because I want to keep this motif secondary to the center one. I'm not liking it, so those stitches will be coming out ... I don't yet know what else will be done instead. PS: The size of these modified star hexagons is 7" from point to point. Nellie - this is beyond gorgeous and I am so excited to see your blocks and beyond that I've even more excited that you did your own thing! Thanks for the great tutorial - I've never made a colonial knot but will use your great tutorial to teach myself! So good to have you back….this is so beautiful…I am excited to watch this come together. My goodness, what a beautiful block!! The fussy cutting is so precise. Did you stack the fabric to get such precision. I am all admiration. 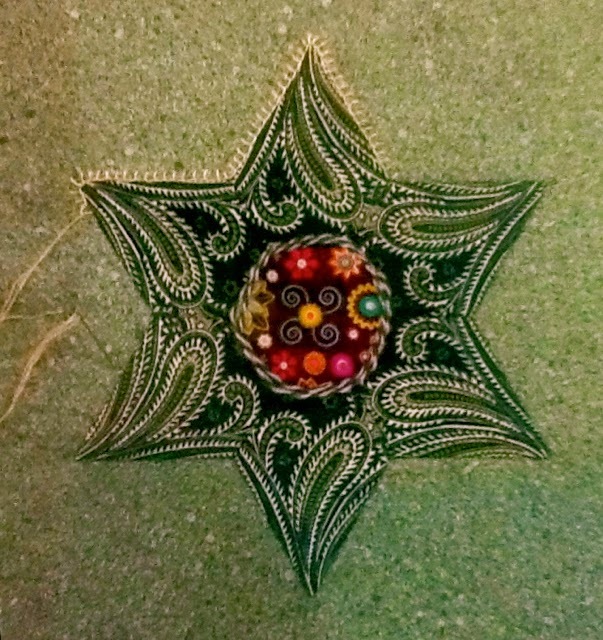 And thanks so much for sharing this fabulous eye candy at Hexie Weekend. Thank all of you for the comments. This quilt along project is so much fun. These hexagon blocks were cut using a window template to find the desired parts on the 1/2 yard of the fabric I already had to make my design. I was tempted to use yardage for this project so I could "stack'n wack" my pieces. I do like a challenge. Nellie, I love the lacy look of your embroidered edge! I went to the link and browsed the start of the quilt- a -long and all its ideas. Here I sat and said to husband that it looks like a lot of work and time ( which I know it is ) More then I would want to take on...He looks at me, nods his head in the direction of the work I have been doing for about a year on Trash Bird and says, Yeah, you do only quick bits...HA~! Love your hexagon blocks and look forward to seeing how it all goes! Lovely! 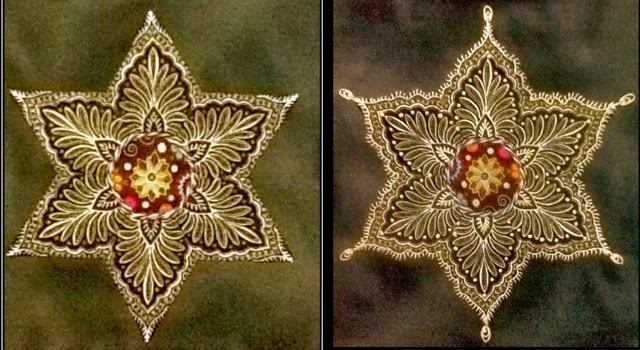 Your inspiration for the embroidery details leaves me speechless!